I hope this finds you well and in good spirits. From Me: We sometimes let our energy and thoughts scatter. Listen to your thoughts and jot down what is most important, then list everything else your mind is directing you. When you write this out you will become more focused and things will begin to make more sense. If you work in the spiritual world, you may either want to learn energy healing or refresh your lessons on working with others energy fields. The Card Reads: Thank you for sending healing energy to me and through me, for my own blessings and for all those around me. Thank you for connecting me to loving and high-integrity healers and teachers of energy-healing modalities. 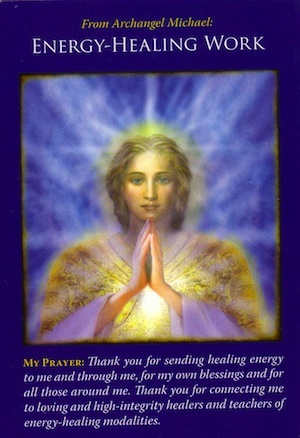 From the booklet: This card signifies that your present situation would benefit from healing energy, which you can elicit from the angels (just ask them! ), a qualified energy healer, or from your own intentions and energy. Possible Specific Meanings: Take measures to boost your energy and vitality, such as exercising and eating healthfully • Enroll in an energy-healing course • Book a session with a qualified energy healer • Your life purpose involves energy-healing work. Grab TONS of Free Empowering Self Improvement Products Now! There are gifts on meditation, manifesting abundance, brainwave entrainment, Law of Attraction, health and wellness, hypnosis, motivation, fitness, nutrition and MORE! Get ready for 2 new exciting events to grow your list if you have a business. I want to help you build your email list by joining this brand new Joint Venture Breakthrough To Success Giveaway Event for free! All the BIG recruiting marketers will be inviting all their BIG Personal Growth Expert friends for this one! There is no catch and you can join as a free contributor. All you need to do is have a giveaway product and a squeeze page. There are already 100’s of people ready to contribute and to help make this the biggest event this year! So we can all work together to build up our email lists. I have been using giveaways for quite sometime to build up my own email list. So jump on this opportunity to build your list before you forget. You have nothing to lose at all! Smart marketers are getting in NOW so they can take advantage of the HUGE COMMISSIONS available on their upgrading referrals, plus the added sales from their special offers! Highly “Contributor Friendly” Event! This event is expected to get many new members in just a few days. The co-hosts, we will be personally sending a lot of traffic to the event and while there will be a One Time Offer after the signup, the first thing they will see is the link to the gifts/downloads page and therefore your gift among others. All the gifts will appear in a few pages (1 to 3). Easy to be reached. All of this will guarantee a lot of traffic and clicks on everyone’s gifts and landing pages. Furthermore, while sending over your traffic and subscribers to visit and join the event you will also earn a lot of commission! The event is an Internet Marketing Giveaway Event which helps people launch/boost their online business. Any IM gifts to help launch or boost an online business are welcome. Are also accepted any personal development gifts which can help people improve themselves which therefore will help them become more productive and improve their businesses. Subliminal recordings help me do better in all aspects of my life. I downloaded them from Steve G. Jones and love them. I play them in the background as I go about my day. 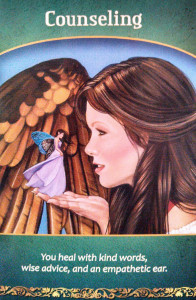 ****Journey of Angelic Healing, Stories to Feed Your Soul. Archangel Michael is portrayed in the feminine here. He is saying not to worry as much as you do because things aren’t always as bad as they seem. I’m hearing, Let nature take its course and allow things to fall into place. It is a time to think about yourself and get in some exercise and “me time”. Michael is coming out of the fire and brings peace into your life. He says if you continue to let things bother you then you will fall into the tunnel of unhappiness. There is an Indian representation here too. I’m hearing it’s time to learn some of the tribal lessons of self-care. When you look at his wings you can see they are wrapped around Michael like a king’s cape which is representing the royalty within all of us. When we allow our emotions get the best of us we fall apart. But when we take time for ourselves things fall into place and our worries fade away. 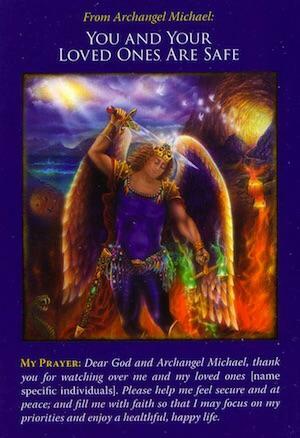 The Card Reads: Dear God and Archangel Michael, thank you for watching over me and my loved ones [name specific individuals]. Please help me feel secure and at peace; and fill me with faith so that I may focus on my priorities and enjoy a healthful, happy life. From the booklet: Archangel Michael and other angels are protecting you and your loved ones… including your family and friends in heaven. This card is a sign that you can relax, knowing that the archangel is taking care of the details and safeguarding you and your loved ones in all ways. I always share about subliminal recordings helping me do better in all aspects of my life. I downloaded them from Steve G. Jones and love them. ~~I am excited to share that I won an award for my book, Journey of Angelic Healing, Stories to Feed Your Soul. 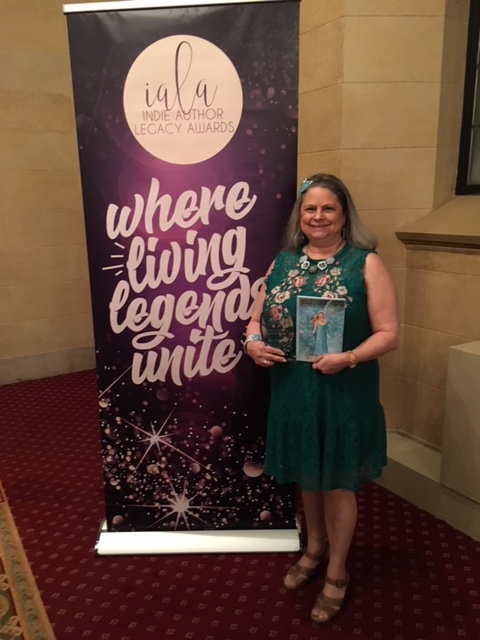 **It is the Indie Author Legacy Award for the Health and Wellness category!! This is such an accomplishment for me because it helps build my self esteem. I was already a best selling author and now I can say I’m an Award-Winning Author!! The Healthy Lifestyle is a message about self worth. We need to take care of ourselves both inside and out. When we do this we become stronger to take on anything that is put into our path. The picture itself represents the strength in all of us. Look at the thick, wide golden wings! 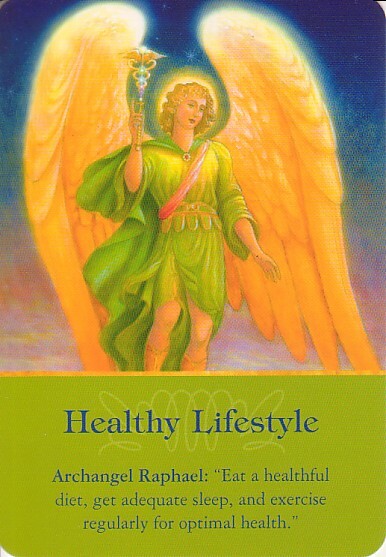 Working with Archangel Raphael: Raphael is Heaven’s physician, and he prescribes preventive and curative medicine in the form of Divine intervention and guidance. In the former, he swoops into the situation and surrounds it with his emerald-green healing light and love – and the situation is instantly healed. 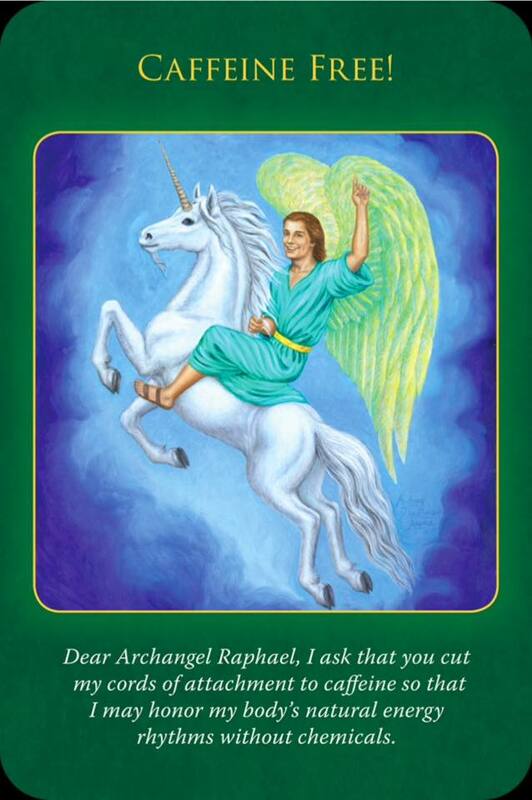 But in the latter (which is actually more common), Raphael will give you intuition and hunches showing how you can help with the healing. 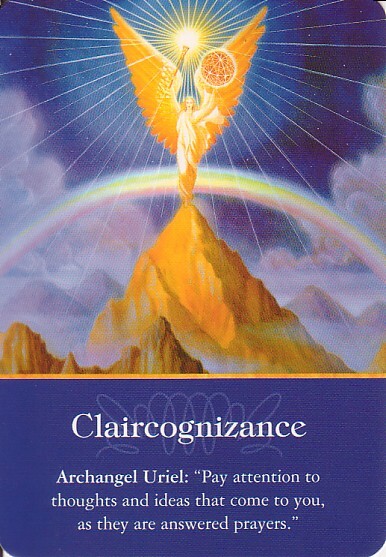 The Claircognazance card indicates a separation. There is the bottom part which represents all you have done in your life. The top is representing what you have yet to conquer. The rainbow is very subtle but represents the layers of actions you have taken and yet still have to take to achieve your greatest goals. There are many mountains to be climbed through the journey. It is all a part of life that these journeys are our highs and lows. If you look at your highs as great accomplishments, try to look at your lows as just smaller accomplishments instead of that of negativity. Working with Uriel: Uriel’s name means “The Light of God.” He’s known for his ability to enlighten our minds with Divine inspiration.Anytime you need answers or insights, call upon Uriel. He answers anyone who calls upon him. 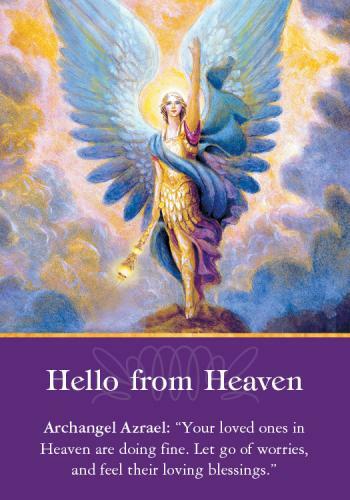 You’ll know that Uriel has answered when you have repetitive thoughts or ideas that are positive, loving and helpful. If you need facts in a hurry (such as during a test or important meeting), Uriel will supply you with the information. After you ask him for help, the answer will pop into your mind. Trust the information he supplies. My interview with Audrye Arbe aired this week. Here is the link and her info so you can learn more from her. Audrye is a born transformation catalyst-mystic intuitive. She is a #1 International Best-Selling Author with her latest book, RAISING RACE CONSCIOUSNESS, Healing Racism, Sexism and Other Isms (RRC), as well as an award-winning artist and former public access TV producer (in NYC). Audrye uses her metaphysical and clairvoyant gifts to empower people’s growth and evolution in private sessions, groups, seminars, lectures, art, books, as she knows it is time for us as individuals and as a species to become the next level of being. This is interesting because Mercury is in Retrograde and when this occurs you are advised to hold off on signing any contracts. The color white is very prominent and represents purity, kindness, love, etc. Take this time to love one another and spend time together doing the things you normally put off. Since you can’t rely on everything flowing correctly during the retrograde, you may as well enjoy time with others or accomplishing a task you have put off for a while. Archangel Michael is looking to the past. He seems to be preparing to let go of what is old and create the new with the white foundation. This foundation is for creating new ideas and putting them into action. Remember to put off those final decisions until after the retrograde so things come together smoothly. **According to the Old Farmer’s Almanac, Several times a year, it appears as if Mercury is going backwards. These times in particular were traditionally associated with confusions, delay, and frustration. 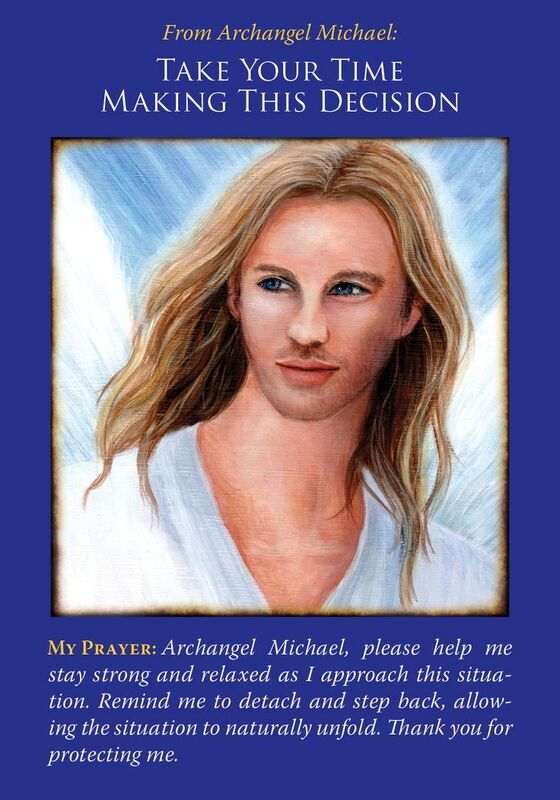 The Card Reads: Archangel Michael, please help me stay strong and relaxed as I approach this situation. Remind me to detach and step back, allowing the situation to naturally unfold. Thank you for protecting me. I would first like to invite you to share if you are planning to write a book, or join a collaborative book. I am working with a wonderful woman and am excited to share her information with you. We will be doing some wonderful events together in the coming year. The first will be a get to know her call. 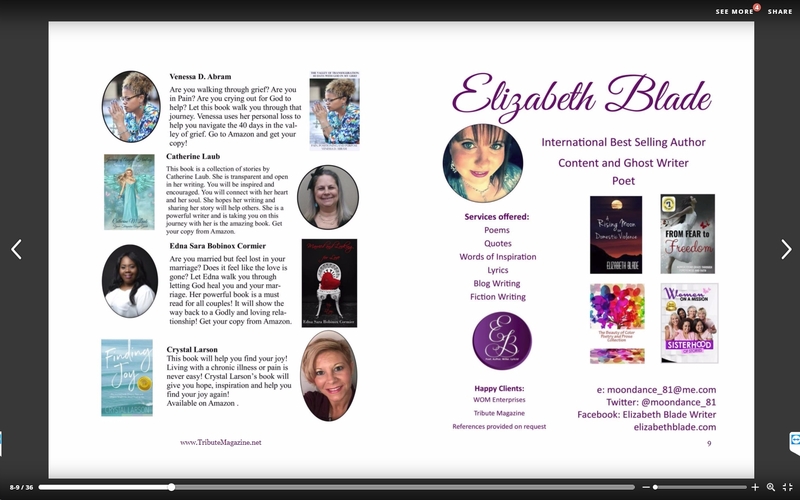 Sophie Bennett is an author and speaker, plus teaches How to write and publish your book. She helps people to develop talent, define and develop a strong business culture and to help you gain the skills and confidence to succeed. We go into 2018 with a clean slate and create our vision with confidence. Being caffeine free is not only cutting out coffee. It is also in teas, chocolate, and various other foods. But this is not only talking about caffeine. I am hearing it is time to clear your body of toxins of any kind and let your health be the greatest it can be going forward. 2018 is a year for many advancements in each of us. When we allow these toxins to get in our way we can’t function properly. I notice if I eat too much chocolate I struggle the next day. It has a physical effect on me. I drank a lot of tea the other day and this too had me feeling very tired and run down the next day. Pace yourself with your food intake to achieve the goals you are meant to achieve. This picture shows a triumph and white is a clearing color. Be mindful of what is going on in your life and make changes to cancel, clear and delete where necessary. From the booklet: Caffeine from coffee, tea, cola, or chocolate is exacerbating the health condition you’ve inquired about. Perhaps your consumption of this substance is increasing your anxiety level, which is creating stress-induced body toxins. Anxiety can also block you from feeling safe, happy, and connected. If you are addicted to caffeine, Archangel Raphael can certainly help reduce or eliminate cravings. Recite the prayer above to call upon his Divine healing powers. Positive specific meanings: Reduce or eliminate caffeine from your diet *Engage in relaxation techniques such as mediation, yoga, or massage. * Notice your tension level prior to and after consuming caffeine, and be honest with yourself about caffeine-induced anxiety * Know that God is the Source of all the energy you could ever need. 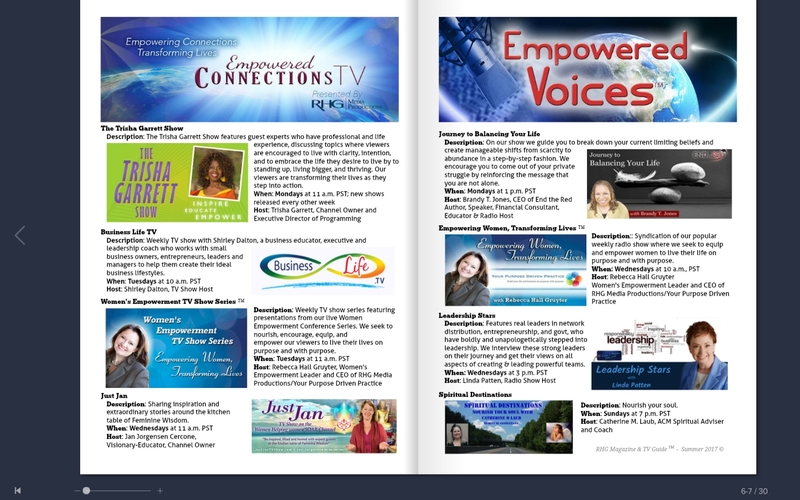 My interview with Dianne Morgan, Spiritual Growth aired this past weekend and I am sharing her info so you can learn more from her. Dianne Morgan is a Mystic Intuitive Spiritual Christian. Claircognant Angel Intuitive, Mystic Intuitive Healer, Spiritual Teacher, and Published Author. She holds Workshops teaching others they have the ability to Connect to the Spiritual Realm; and how to identify and work with the Angels. She is dedicated to helping others with their Spiritual Growth. 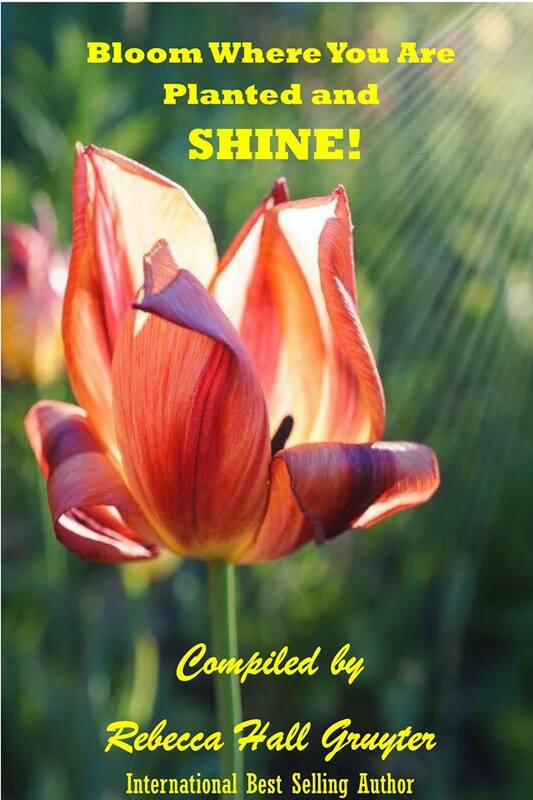 This is a teaching book, sharing Dianne’s experiences with others to help them understand how Spirit communicates with us; and that everyone can communicate with Spirit! Archangel Raziel came to her a few years back when she was writing an outline for a workshop, he said “Keep it simple, because it is! Humans have made it far too hard to understand their connection with us.” So that’s what she did in the book, kept it simple and answered questions that most beginning their Spiritual Journey ask. Dianne’s advice for a new entrepreneur is to hire an Angel Team to help you. Take Daily Action, anything that keeps the positive energy flowing. Don’t give up, affirm your desires! I continue to babysit Natalee Tuesday’s and Thursday’s so it would be hard for you to get me those days. January is a busy month for me. I am travelling a lot for training courses. I have already been to Florida and am going back Wednesday. I also had 2 events in New York with my Women’s Prosperity Network sisters. When I return January 30th I will be refocusing back to my weekly newsletter so you can get your readings. Any time you want to call me, please leave a clear message with your phone number with area code saying it slowly so I can understand it and get back to you asap. 631-619-2040 I share this line with my husband’s business too. We do not answer the phone much because we get too many scams and our caller ID doesn’t read out for us. **I still have many of my custom photo frames for sale. If you would like to purchase them, please email me at cathysquests@yahoo.com and I will send you photos of the designs I have left and the fabric I can make new ones with. Best Seller! I’m so honored to be part of this book and share some of the powerful impact Grandmothers have had and are having in our lives! ***My bigger focus now is to speak on stages sharing my story of mental illness. I plan to write a book as a support if you need guidance how to come through your stressful times. 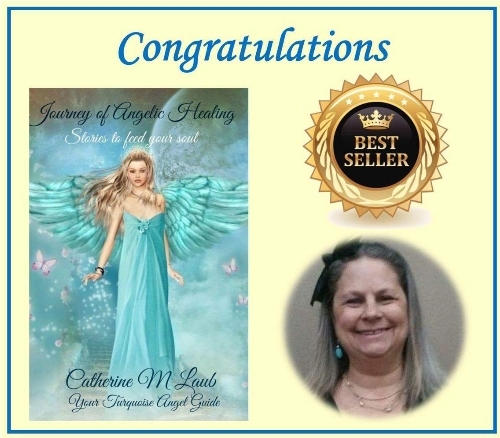 ~~MY BOOK Journey of Angelic Healing, Stories to Feed Your Soul. I am very spiritual and love sharing about spirituality and inspiration. I am a Radio Show Host of Spiritual Destinations. I am certified as an Angel Communication Master and do psychic angel card readings. 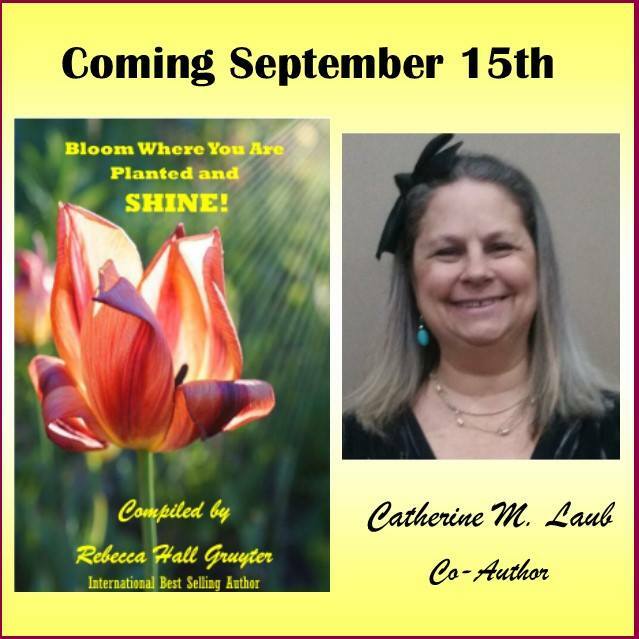 I am a thirteen time best-selling author and speak out about mental illness in my campaign “Brighten Your Day with Turquoise”. Since I am totally out of whack with my postings I decided to pull it all together here. Take a look at the strikingly illustrated Coloring Books by authors such as Louise Hay, Doreen Virtue, Mike Dooley, Sarah Wilder & Alina Shalev. Own the Coloring Book that speaks to you for 50% off Now – Dec.7th! Shop Today! Express your creative side with the Hay House 50% Off Coloring Book & Calendar Sale, Dec. 3- Dec. 7! And get Free U.S. Shipping on orders over $20. Look for an inspirational and fun Coloring Book or 2018 Calendar now! Pick up your 2018 Hay House Calendars for 50% off before the new year begins! Their catalog features calendars from Louise Hay, Dr. Wayne Dyer, Robert Holden, Doreen Virtue and Esther & Jerry Hicks!! *Free Shipping when you spend $20 or more. The Hay House 2017 Holiday Catalog has over 200 products this year! If you don’t have the time to keep watch on which sale is going on, you can just find them all in the general 2017 Holiday Catalog. I am one of ONLY 31 Coaches, Healers, and Spiritual Entrepreneurs, who have joined together to spread Holiday cheer and Free Gifts to help you navigate the Holidays and start 2018 strong! This giveaway has a new twist to it that combines the fun of a Daily Count Down Type calendar (think Advent calendars or Christmas countdown calendars) with 31 Free Gifts selected to make your Holiday Season even more enjoyable. This unique Gift Giving Event is the perfect way to treat yourself to something special each day to help you stay centered, focused, and to have some fun while you keep moving forward into the New Year. Of course, if you want to get them all at once, you can. However, that sort of takes away the fun and anticipation of seeing what tomorrow brings. Don’t you think? Vision Boards and Creation Journaling Guide – from Yours Truly! So, take some time for yourself and treat yourself to some wonderful free gifts! Learn how to create a vision board or creation journal with images, pictures, words and affirmations of your dreams, goals, and things that make you happy. These fun tools help put you on track if you are out of focus. They help you manifest everything you desire in life. This is perfect for this time of year. We are all prone to overeating all the wonderful food and goodies at the holidays. If we do so, exercise is key to not letting the pounds add on. What I’m seeing in the card is a person who feels very private and at the same time, very loving. This angel’s wings form a heart and indicates a very passionate person. Remember to keep that passion going forward this time of year and let the festivities cheer you on. In addition to drawing this card, you’ve likely been receiving an intuitive message to exercise more or to add alternate forms of exercise to your current routine. Let this card be a validation that being active is a key component in your health and healing (or for the person you’re inquiring about). 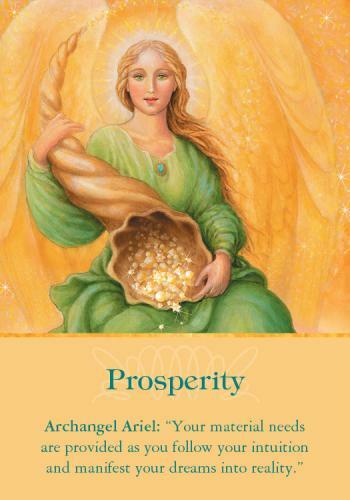 Even if a consistent workout routine seems unfeasible because of schedules, health, finances, or other apparent blocks, Archangel Raphael can help you find balance through a practical and enjoyable exercise avenue. He’s also a great motivator for those who procrastinate or avoid physical activity. My interview with Dr. Dawn Karima aired last week and I am sharing her info so you can learn more from her. Dr Dawn Karima is a two-time Global Music Award Winner, Winner of a Native American Music Award, and the Winner of an Indigenous Artist-Activist Award. She hosts a syndicated radio show, A CONVERSATION WITH DAWN KARIMA. Dr Karima is the author of two novels and has several accomplishments including that of a Mvskoke/Echota Shellshaker, Women’s Traditional Southern Cloth powwow dancer, Jingle Dress Dancer, Indigenous Theologian, Filmmaker and Journalist. As a prominent Speaker, Educator, Artist and Consultant, she is available to hire for speaking engagements, presentations, media making, academic instruction, consultations, performances, storytelling and cultural education. I babysat Joshua, Natalee and Carson last Saturday. I had so much fun with them!!. Natalee just started crawling and sitting by herself. She also had her first 2 teeth break through. I love seeing babies advance through their growing stages. Joshua and Carson had lots of fun together then we all played with the slot machine. I worked at the psychic fair last Sunday. It was a total flop and most of us sat around all day. I was disappointed because I hoped to make some money for Christmas gifts. So this year everyone will receive homemade gifts. 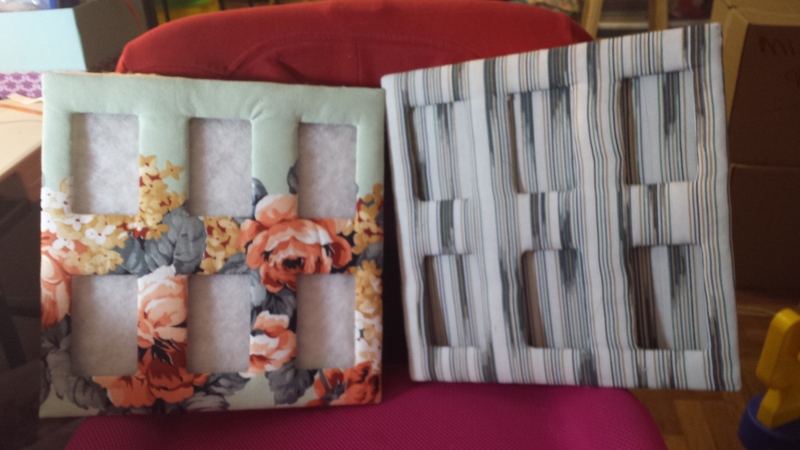 I love making crafts so it will be fun to make everyone different gifts. 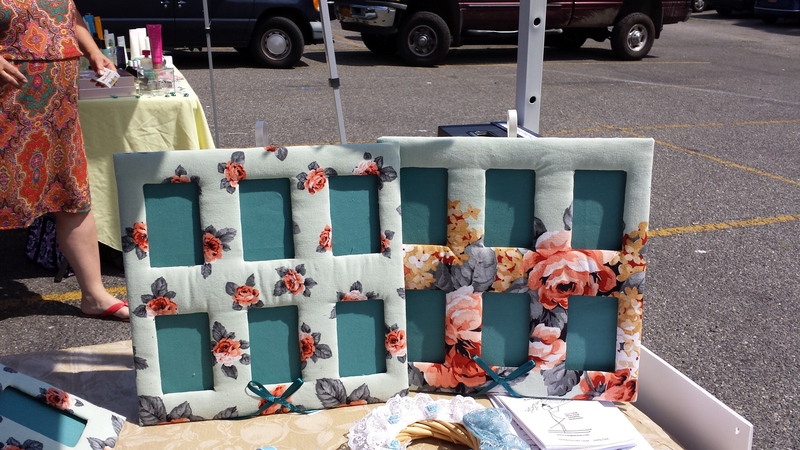 I make custom photo frames which I sell at fairs. I saw the cutout cardboard many years ago from power supplies we used to assemble. 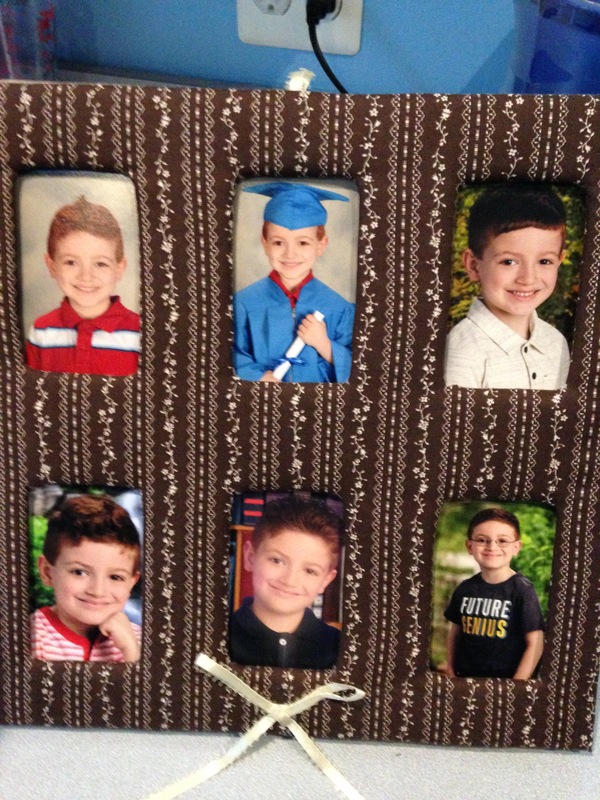 Once I saw them I knew I could create the photo frames. I still have many of these cardboard cutouts so am still making the frames. If you would like to purchase my frames, please email me at cathysquests@yahoo.com and I will send you photos of the designs I have. 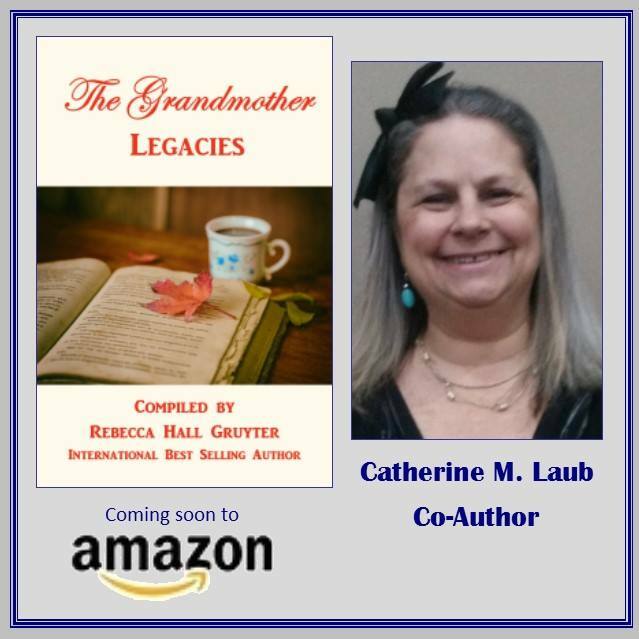 ***Watch for the release of my 13th book, The Grandmother Legacies December 5, 2017 and get the a special rate of $1 USD! Only available for the first 24-72 hours! I’m so honored to be part of this book and share some of the powerful impact Grandmothers have had and are having in our lives! 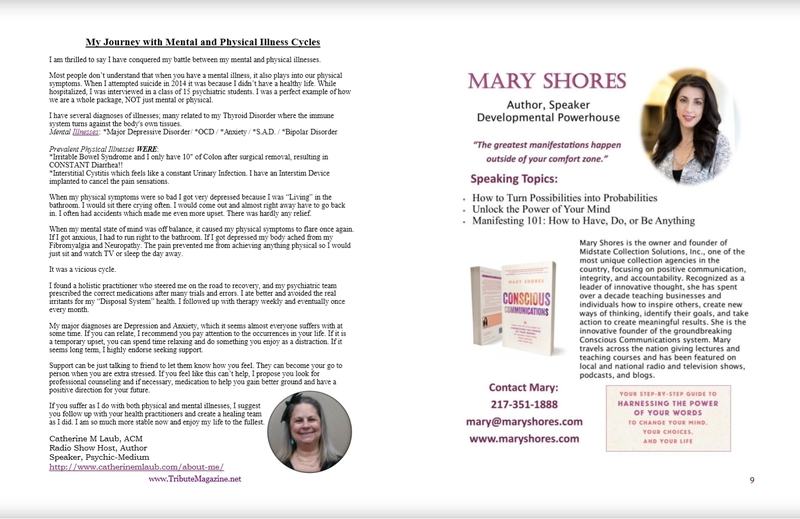 ***I began a new focus to speak on stages to share my story of mental illness. I will be writing a book as a support if you need guidance how to come through your stressful times. I am very spiritual and love sharing about spirituality and inspiration. I am a Radio Show Host of Spiritual Destinations. 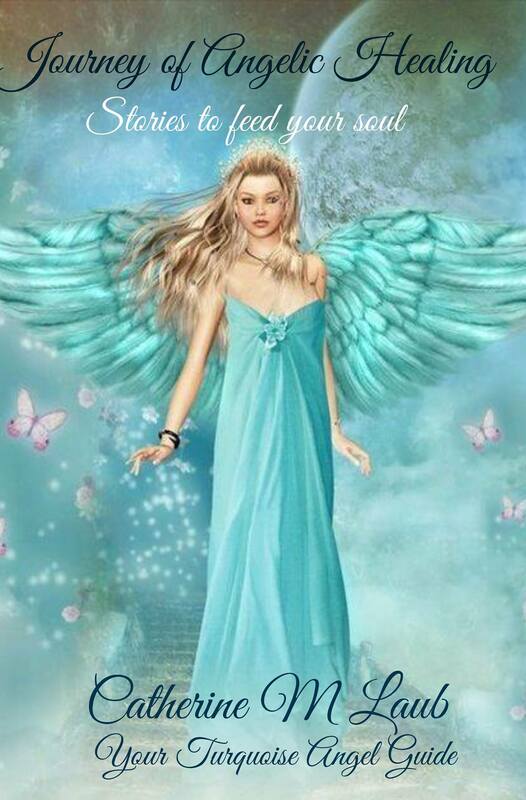 I am certified as an Angel Communication Master and do psychic angel card readings. I am an eleven time best-selling author and speak out about mental illness in my campaign “Brighten Your Day with Turquoise”. This makes me think of batman and how he protects Gotham City. He is always ready and able when crime happens. Think of yourself as this protector. Arm yourself with the correct armor for the things life may throw your way. It may be something as simple as keeping your strength up by eating a healthy diet, exercising or walking. It may be something you have to learn by reading about it because someone in your family is going through something that you don’t understand. Whatever it may be, you will have an inner knowing when you read this and a light bulb may go off. 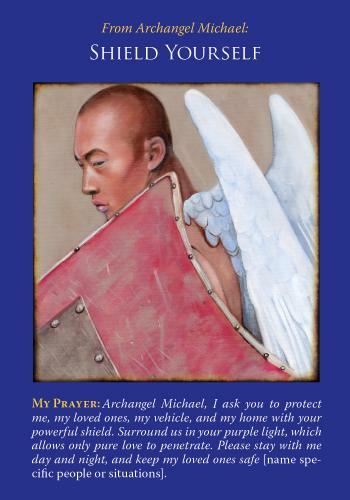 If you are feeling stuck, remember that Archangel Michael is always there to get you out of a jam if you ask him for his help. You may be feeling let down by someone and are struggling to move past it. You may now feel unsure of this relationship. If it is the case, allow yourself time to process what happened before you make any hasty decisions. You are safe and supported while you change your career. The angels reassure you that it’s safe for you to make a career transition, and that you’ll be supported along the way-provided you listen to and follow your inner guidance. This card indicates that the time is ripe for you to make this change. Hold the intention that this change will allow you to bring more blessings into the world, as an attitude of selfless service will allay the ego’s insecurities. The more you focus upon service, the less your ego will try to delay your happiness. You, like everyone, have a unique and much needed life purpose that awaits you with open arms. When you fully commit to helping others through your purpose, the doors of opportunity and support open wide. Your career transition will ride upon the smooth wings of the angels, as long as you’re focused upon serving a higher good. 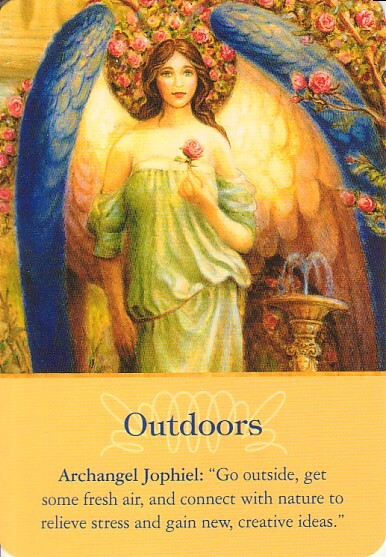 Continue to call upon the angels for guidance, support and protection through-out your manifestation. If you find yourself feeling insecure or nervous, put hour entire focus on service. When you intend to serve a purpose, that’s when your purpose will begin to serve you. An affirmation can be positive or negative. When we talk about affirmations in self-help we are looking for those that will create a positive effect. There are so many affirmations related to each situation you are experiencing. I use simple affirmations like I AM HEALTHY, I AM HAPPY, I AM WEALTHY. You can make up your own affirmations or use some of the ones below. A great idea is to write 3 affirmations down on a piece of paper every morning and carry them with you all day. Periodically, pull out that paper and read your affirmations. When you read them, try your best to visualize the affirmation coming true as if it has already happened. Adding visualization to your affirmations super-charge them and make them attainable faster than just by just saying them. Make writing and saying affirmations your daily routine. They can and will make a major positive change in your life. I Am a good person and I do kind things for others. I Am excited about doing things for others today. I Am happy today and I will share this with other people today. I Am dedicated to do kind things today. I Am committed to make a difference in the world today. I Am determined to do kindness several times today. I Am determined to remain happy today. I Am a happy person today. I Am happy today and I will share my happiness with others. I Am filled with happiness today. I Am dedicated to share my happiness today. I Am aware of staying happy all day today. I Am a powerful magnet for money and happiness. I Am a powerful magnet for my desires. Oceans of money flow to me. I Am deserving of abundance and happiness. I Am worthy of all the magnificent things I create. I Am one step closer to creating my desires. I Am dedicated to creating abundance in all aspects of my life. ***I missed last week’s newsletter again because I was very sick with a chest and head cold. It is still lingering but not keeping me down. ***My mother’s blood work is good this week so we will be going to bingo today!! ***Many things are coming together for me that were worth the wait!! It’s time to get your hands on the largest selection of FREE Personal Development Products & Services that you will find anywhere! The line up of gifts I’ve seen are some of the most powerful Personal Development eBooks, memberships, videos, audios, software, and e-courses on the net today! They’ve assembled the who’s who of Personal Development Experts and you’ll be able to grab 1000s of dollars worth of products & services – all geared toward improving all aspects of your life! 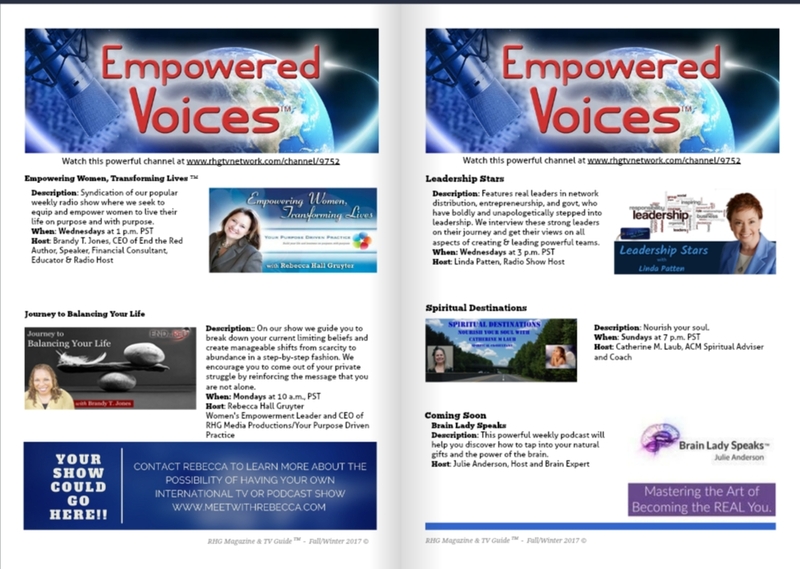 * From: Kim Knight – Which healthcare is right for me? * From: Stephanie Mulac – End Your Insomnia TONIGHT! 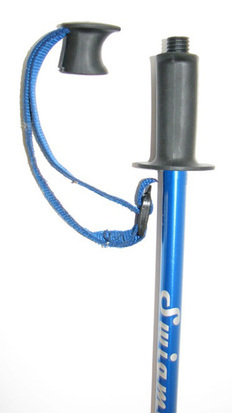 ~~My husband Tony is selling specialized ski poles and the price is set to go up soon. These poles have a special handle that screws off so you can carry any liquid with you and have it conveniently available any time you are on the ski slope. It’s interesting that this card should come forth this week, since it is Mental Illness Awareness Week. It is time to reach out and find the counselor that will most benefit your symptoms. Please don’t settle if you find someone who you don’t click with. I see the wing to be a teepee and feel it is speaking about getting back to nature as the Indians do. By doing this you are grounding and forming a powerful foundation with your Base Chakra. Please acknowledge your own awareness of this debilitating disease and reach out to anyone that seems to be needing a friend to lean on if even just for a short while. If you struggle with mental illness in any form, take time this week for yourself. Learn how to relax by using meditation, yoga or anything else that may be relaxing for you. You can learn more about this and purchase just the right subliminal’s for yourself by going to Steve G. Jones website. I normally post this information weekly but am sharing it this way as to provide you with something that may be the simplest way to relaxation and feeling better. Your counseling path can be along the lines of life coaching, here you help clients organize their goals and intentions into achievable steps. Or you can blend in spirituality through traditional pastoral counseling, or via the more alternative path of giving readings. Your work could also involve writing or teaching. The main point is that this life purpose uses words as a healing modality. With the proper training, you’re highly qualified to conduct counseling work. Please don’t think that your own life needs to be perfect before you can help others. All counselors have their own ego issues and “imperfections.” The point isn’t whether you have these character and life quirks; it’s what you do with them that counts. As long as you listen to your clients’ feelings with an open mind and heart, their needs will be served. ***Here is a special message about a contest that ends today. I’m sorry I didn’t get it out to you sooner. If you are a business owner and are looking to set up webinars you can join this contest. Over $3,000 In Prizes Including FREE Subscriptions to Demio, Deadline Funnel, Slide Sell and MORE! Here is another way to learn to relax and help you with your ailments. Discover Exactly What Dis-empowering Beliefs Are Holding You Back From Having the Body and the Confidence You Deserve! You’ll get access to all 103 Dis-empowering Beliefs and through the Beliefs Discovery Process, you’ll learn exactly which ones are holding YOU back! This is a reminder to get tons of resources that you’d normally spend thousands of dollars on!! All at no cost to you!! Simply join the internet’s most amazing GIVEAWAY, specifically for spiritual people! ***I am excited that I am healed and finally accomplishing things!! This past weekend I set up my fall decorations which include my ceramic house village. I still have several houses up that I decided to keep out all year and just add to them for each holiday or season. I really enjoy setting these up and viewing them daily, especially when their lights are on at night. ***I am taking my mother for blood work today and pray the counts go up. She went to the hospital last week for her cancer treatments and was sent home the next day because her immune system is almost non-existent. She told me she doesn’t feel any different and it is just the disease that makes the blood fluctuate. I am thankful for the time I do get to spend with her. ~~If you want to learn how to create a website with ease, you can do so now with Christina Hills. I learned how to create my site and am very thankful for her guidance. * It’s going to be too expensive. * It requires fancy technical know how that’s way over my head. * It’s going to take way too much of my time. * I don’t have a clue so why even get started? ~~My book became a best seller overnight!! Thanks to all who purchased a copy! These stories are all compiled from the previous books I contributed to. You can now read them all in one place. I chose “Journey” because it is about my healing and spiritual journey. “Stories to Feed your Soul” because my business name is The Celestial Spoon, Inc.; It Feeds Your Soul. Then my radio show ads read Spiritual Destinations, Nourish Your Soul With Catherine M Laub Spiritual Consultant. The cover photo is, of course, an “angel” because I am an angel communicator. It is “turquoise” because I share how turquoise helps with mental illness. There is a “Path” that represents my journey. The “Butterflies” represent transformation. The angel herself represents my power in bringing you these inspiring stories. You can listen to replays at any time. Please note that every week I share recent recording information here. ~~Listen to my interview with Ayesha Hilton, an Amazon bestselling author, transformational coach, speaker and business success mentor. She is book lover, and spiritual adventurer, as well as a mother of two! She is also the founder of the Practical Wisdom Academy and the Practical Wisdom podcast. She loves working with women and helping them embody their feminine essence and witnessing their increasing empowerment. I am feeling calm and there is no stress. It is as if we are going back to basics like a newborn child who has no bad thoughts and loves everyone and everything. Take this time to ponder on your life and make any necessary changes you are needing to create this serene life. 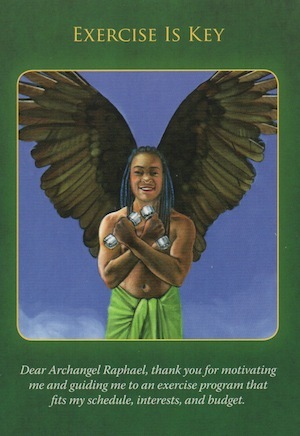 These wings are creating a thin layer of protection to support you while you make these changes. 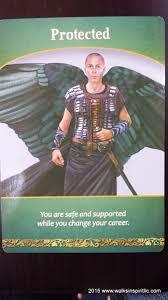 You may feel nervous about making a drastic change but the angels are saying now is the time. Working with Jophiel: Jophiel’s name means “Beauty of God.” She sees beauty in everything and everyone, and helps you do the same. Jophiel knows that when we spend regular time outdoors, we’re cleared of lower energies, and naturally have a more beautiful outlook on life. Call upon Jophiel to ease your schedule to allow for outdoor time: plan a nature-based vacation, move to a more rural environment, start a butterfly garden, or just connect to nature in any way that pleases you. ***I forgot to mention that last week, September 18th was my and Tony’s 25 year first date anniversary. We spent it at a mastermind business group. Our wedding anniversary was August 22nd and we celebrated 18 years of marriage. We spent this anniversary at a networking event. Does this tell you how dedicated we are to our business lives? ***I have been babysitting on and off the last few weeks and just loving it. Joshua is 7 and Natalee is 4 months. They are so much fun. This is a representation of beauty and happiness. You are attracting the right people to continue this feeling of happiness. Everything is flowing smoothly and the vibrant colors speak loudly about the support from God, Source or whatever you recognize to be the creator. You are blessed with an abundance of friends and love relationships and are being reminded to acknowledge them and thank them for being in your life. Jacob Cooper has been in touch with spirit since a young age. He is a near death experience survivor at the age of 5. He has always been open and in touch with the spirit realm. He spreads his experience and message to others to bring lightness towards death and help others re-remember their own spiritual truths. Jacob has been a serious seeker of metaphysics since a young age. He practiced and studied yoga and meditation for many years and has had many life altering experiences through this. Jacob is a Reiki Master Teacher and also had training in his own intuitive development to continue opening his abilities. He is also a guest lecturer for several New York spiritual centers Libraries and serves as a guest on metaphysically and spiritually inclined radio shows. Jacob also provides services as a Licensed Master Social Worker and is employed as a Mental Health Counselor. Connect with Jacob to learn more about his journey and how he can support you. ***My newest collaborative book released Friday. Time really flies!! This book is about many people blossoming from being unknown to superstars who shine in the world today. The paperback version will be released next week. Listen to my interview with Jacob Cooper who has been in touch with spirit since a young age. He is a near death experience survivor at the age of 5. He has always been open and in touch with the spirit realm. He spreads his experience and message to others to bring lightness towards death and help others re-remember their own spiritual truths. Jacob has been a serious seeker of metaphysics since a young age. He practiced and studied yoga and meditation for many years and has had many life altering experiences through this. Jacob is a Reiki Master Teacher and also had training in his own intuitive development to continue opening his abilities. He is also a guest lecturer for several New York spiritual centers Libraries and serves as a guest on metaphysically and spiritually inclined radio shows. Jacob also provides services as a Licensed Master Social Worker and is employed as a Mental Health Counselor. Please remember when you listen to leave a comment, good or bad. I feel a sense of calm and excitement combined. You may have been working on a new project and it is now complete so your stress level has dropped. You are now calm and relaxed because you met your deadline and everything turned out perfectly. The excitement is that of completion because you may have thought I can never get this done and may have even thought about having someone else take over the project. Take in this success and bring forward the excitement that you CAN get things done when you put your focus on it. You can toot your own horn because you feel exhilarated and want to share this accomplishment with others. It is something worth sharing. You have revealed the real you and nothing can stop you now. Bring forward the confidence this gave you and know not to put pressure on yourself because you know how to get it done. 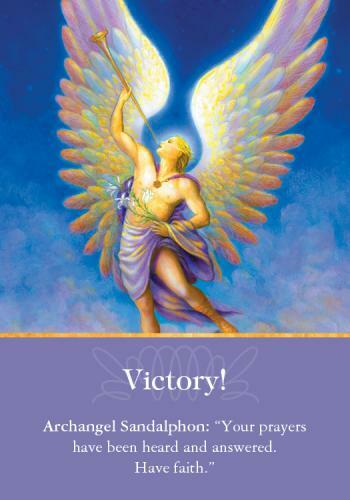 Working with Archangel Sandalphon: Sandalphon is one of two archangels who were mortal men, who lived such remarkable spiritual lives that they ascended into archangeldom (the other one is Metatron). Sandalphon can help your life be a masterpiece as well. Ask him to help you live in integrity, with your spiritual gifts of prophecy, healing, and manifestation fully awakened. Sandalphon can help you speak your truth openly, in a way that benefits everyone. He’ll also help you appreciate all the miracles and victories—of every size—in your life. 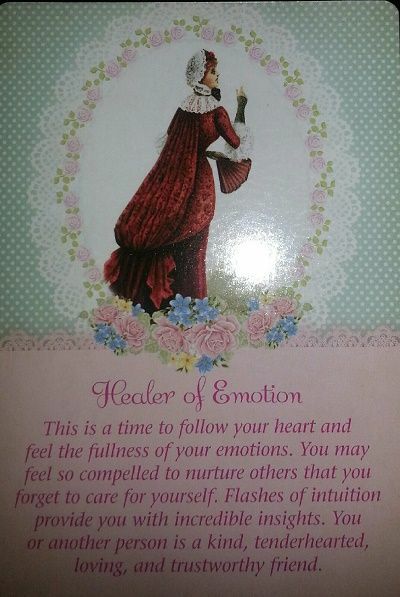 This card also brings in a calm feeling and sense of satisfaction. It shows strength and confidence and a sense of overcoming obstacles. Stand strong in your power and know you are an inspiration to others. I see great wealth, not explicitly with finances, but with love and relationships. You are ready to light the torch and lead the way. You have done your homework and now is the time to implement what you have learned. ***Both of these cards represent your connection to God and the Universe and shows you standing tall as a leader for others to gravitate toward you. Heather has over 30 years of professional performance experience on stage as an operatic soprano, as a national speaker and as the host of the popular podcast and television show, “Thrive.” She combines her unique performance skills with her expertise as a personal brand strategist, image consultant and business coach to teach driven entrepreneurs how to become highly profitable, dynamic presenters and rise to celebrity status. Her clients have appeared on national platforms and made thousands of dollars speaking live and in front of the camera. However, Heather’s greatest love is helping entrepreneurs get to the core of who they want be and giving them the tools to express themselves powerfully and authentically. Do you want to get booked to speak and make money from your appearances? If you want to be an industry star who makes serious bank and impacts thousands or even millions of people, you need to know how to show up in a way that turns heads! You have to have a clear, powerful message and a look that gets all eyes on you. You need to know how to perform like a power house to move your audience to action. Basically, if you want to be known as a gifted expert who makes big bucks, you need to know how to position and package yourself so others see your brilliance. Unfortunately, most entrepreneurs never rise to celebrity status because they don’t know how to package their talent so the right people see their value. They don’t have the look, confidence or charisma to turn heads. If YOU want to be seen as a star, you have to know how to show-up as a star. Those who do, get to experience the kind of success most people can only imagine. Speak at the most prestigious events and conferences. Make guest appearances on the hottest podcasts and media outlets. Attract other industry leaders for lucrative and meaningful collaborations. Become known as the person who can deliver SUPERIOR RESULTS. http://yourdivinebizgifts.com/go/19 Enjoy your free resources! ***My newest collaborative book releases Friday. Time really flies!! Listen to my interview with Heather Poduska, who has over 30 years of professional performance experience on stage as an operatic soprano, as a national speaker and as the host of the popular podcast and television show, “Thrive.” She combines her unique performance skills with her expertise as a personal brand strategist, image consultant and business coach to teach driven entrepreneurs how to become highly profitable, dynamic presenters and rise to celebrity status. Her clients have appeared on national platforms and made thousands of dollars speaking live and in front of the camera. However, Heather’s greatest love is helping entrepreneurs get to the core of who they want be and giving them the tools to express themselves powerfully and authentically. I am looking forward to this podcast in my weekly podcast listening. Having a dose of support right in my ears. Congrats to Spiritual Destinations show host Catherine M. Laub for a great interview. What a honest and vulnerable show! Thanks for sharing the journey of growth and helping break this perfection paralysis that is spreading among women. I began writing this on July 19th then was unable to follow through until today. I wrote: This is ironic since I have been feeling lots of emotions with my medication change. I am doing much better now but it was a rough few weeks going through the ups and downs. Think about this in your own life where there may be changes going on. If they are sudden and you never thought in a million years that this would happen to you, please recognize there is a reason and a lesson in these changes. Take everything with a grain of salt and put perspective into the situation. Think before acting because you may be too hasty and make mistakes. Ask your angels to guide you to the real message behind the turmoil. You’re experiencing a calling to live a life immersed in the waters of emotion and intuition. You have a true desire to help others and are blessed with a great depth of feeling that comes naturally. Compassion flows from Divine Spirit into your heart. It seems as though you’re immediately award of what others are feeling and what their hearts need. Family members and friends are cherished, but even strangers feel your love radiation out to heal the world. Intuitive abilities are very strong. People: A person whose loving arms are always open. Someone sensitive and very empathetic, tenderhearted, and generous. Someone who always knows what to do and understands the problem before it’s even spoken. A fairy godmother who can make you feel better just by being around. Additional meanings of this card: A spiritual teacher. An emotional counselor. The need for better boundaries. A love of hearth and home. A very trustworthy friend. Do you want to enjoy a more abundant, happier life through a better-run, profitable business? Do you want to know you can step away from your business without worry or engage in it at the executive level where you belong? And, do you want the full value of your business to be in the business and not your head? Ironically, the changes to achieve this start in your head; the beliefs, expectations, habits and attitudes that limit possibilities you might enjoy and guide you to the outcomes you’ve enjoyed so far. I apologize for not getting my newsletter out for the past month. My minor surgery took longer to recover than it should have but I am back. I look forward to reconnecting with everyone and welcome any questions you may have. I will be down the Author Alley selling and autographing my books. My book became a best seller overnight!! Thanks to all who purchased a copy! This week listen to my interview with Jean-Marc Berne, Known as the “Voice Master,” He is the author of “The Heart-Voice Connection: How to Infuse Your Message with Real Emotion,” He is also an International Public Speaker and Singer-Songwriter. You don’t want to miss Jean-Marc singing during their talk. Jean-Marc is the Voice Over Coach of the animated series The Octonauts, which airs on The Disney Channel. He powers up people’s voices to project, command confidence, engage their audiences, and connect with the heart of their stories, generating more money for their respective businesses. You can also listen to all the other episodes with the following guests. If you would like to interview with me for Spiritual Destinations, you can schedule an appointment with my calendar. Please schedule here https://www.timetrade.com/book/DNYCN. Once I have your information I will send you a questionnaire to prepare for our talk and for you to email back to me. These interviews will be recorded then scheduled for my show. You will receive a link for your recording that you can share with others. Please leave a comment on the broadcast page and let me know what you liked about my interview and what you didn’t like. I want to be sure I bring you the information you are looking for in the best way possible. A new giveaway begins in just a few short days. Your Divine Biz Gifts Giveaway. Watch for the links to get your FREE gifts!